Variation on a theme is popular around here when time is short and I am in a hurry to get something on the table everyone will eat. I have mentioned the reliability of frittata, well, here’s my plug for pancakes and fritters. Pretty much anything and everything around here has been shredded and put in a regular pancake mix or been moistened with an egg and a little milk, then fried and served up with sour cream, salsa or syrup, depending on the ingredients and the mood. 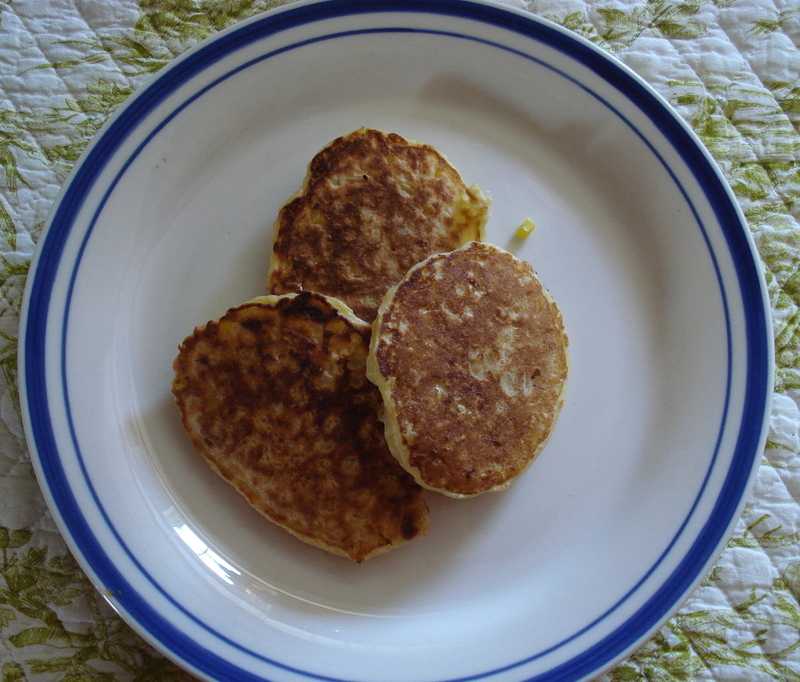 Corn Pancakes: I like to take the leftover corn off the cob and mix it with a little pancake batter, fry up and serve with butter and syrup. Sometimes I just add a handful of flour and an egg to the corn (as we do with shredded zucchini) and fry that – more like a fritter. My sister does the same fritter thing and then tops them with cheese and salsa. This entry was posted in Recipes and tagged corn, pancakes, zucchini. Bookmark the permalink. 2 Responses to Pancakes and Fritters! I like something similar made with rice flour and a bit of cornstarch. You can make little pancakes using any sort of veggie or seafood and then dip them in soy or some other sauce. Yes! One night a heavy rain prevented me from grilling the squash and zucchini as planned. I grated them, tossed them with egg, coated them with flour, and pan fried them. They were really tasty, especially with a good amont of basil mixed in the batter. Next time (and there will be a next time, I’m sure) I’ll salt the veggies and drain the excess liquid first.